Every now and again, I’m asked for guidance on project management. Here are some thoughts, based on my experiences. I formally became a project manager in 2004, but it seems that I’d been a project manager for many years before then, without really recognising the term. When working for Essex Radio in the mid-to-late 1990s, I was actively involved on three big projects, the Essex FM website, installing the playout systems for radio stations in Southend, and the Year 2000 compliance project for the Daily Mail group of radio stations. My first formal project Management role was with a company called Mobile Innovation, based in Central London, after transitioning from roles in software specification, and new business development. Waterfall – Requires a solid specification and a committed team with the right skills. Phase-based delivery – Requirements > Planning > Specification > Design > Development > Testing > Release. It’s a rigid framework, but makes for easier planning and clear deliverables. Gives the option for reviews at each phase. Ultimately, which type you pick depends on the customer. If you have a free hand, the key is to set milestones early, and keep the customer informed of progress towards the next milestone. 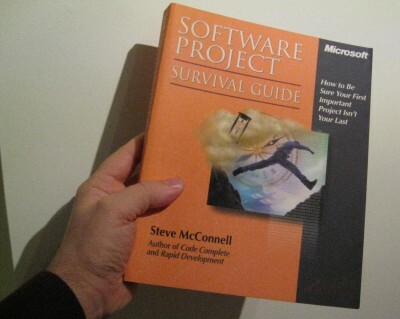 Book Blurb: Equip yourself with SOFTWARE PROJECT SURVIVAL GUIDE. It’s for everyone with a stake in the outcome of a development project – and especially for those without formal software project management training. That includes top managers, executives, clients, investors, end-user representatives, project managers, and technical leads. Here you’ll find guidance from the acclaimed author of the classics CODE COMPLETE and RAPID DEVELOPMENT. Steve McConnell draws on solid research and a career’s worth of hard-won experience to map the surest path to your goal–what he calls "one specific approach to software development that works pretty well most of the time for most projects." Nineteen chapters in four sections cover the concepts and strategies you need for mastering the development process, including planning, design, management, quality assurance, testing, and archiving. Got a question, or a suggestion for what can be added to this page, please get in touch.